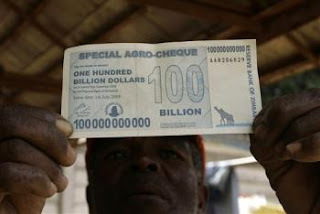 HARARE, Zimbabwe (AP) -- Zimbabwe's bank chief plans new currency reforms - removing "more zeros" from the plummeting Zimbabwe dollar and raising the limit on cash withdrawals - to tackle the country's runaway inflation and cash shortages, state media reported Sunday. Zimbabwe was ok up to a few years ago. We will go the same way if we don't avoid similar mistakes. There goes all the money in the world.. just to pay for a loaf of bread.